If there is one definitive, reigning holiday tradition at the Metropolitan Opera in New York City, it’s Engelbert Humperdinck’s fairy tale opera Hansel and Gretel. Since its Metropolitan Opera premiere on November 25 in 1905 with the composer in attendance, the work has been frequently performed by the company during the winter months. In fact the Met’s first complete opera broadcast was of Hansel and Gretel on Christmas Day, 1931. The popularity of Hansel and Gretel at the Met had a resurgence with the premiere of the current production by Richard Jones on Christmas Eve in 2007, followed by a Live in HD presentation on New Year’s Day, 2008, featuring the late British tenor Philip Langridge as the Witch. Since then, America’s most prominent opera company has continued to put on H+G each successive season beginning in December. This season’s run of performances begins on Friday, December 16, with a total of eight performances through January 7, 2012. 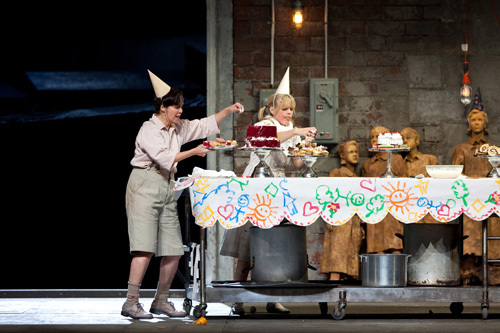 The Met has made Hansel and Gretel an English-version, family-oriented opera event, with a December 22, 6:30 pm (local time) Encore presentation of the original 2008 Live in HD transmission in select movie theaters throughout the country. For a complete list of participating theaters, visit here. While the opera’s plot has no direct holiday connection, the brother-sister duo’s encounter with a gingerbread house-dwelling Witch does bear an air of whimsy and inexplicable magic in keeping with the holiday season. This production features Kate Lindsey and Alice Coote taking turns as Hansel, Aleksandra Kurzak as Gretel, and Robert Brubaker as the Witch. For more information about the Metropolitan Opera’s production of Hansel and Gretel , visit the Met’s website.